Forced to flee when he is discovered performing an unholy experiment on a still warm corpse which was brought to him by a body-snatcher, Baron Frankenstein and his assistant, Hans, are able to escape to the Baron's old castle, high in the mountains of Karlstaad. The castle is a shamble, and Frankenstein explains that it was wantonly wrecked by outraged villagers who had stormed the castle and pillaged it when they found out the Baron had created a living being-an unearthly creature-out of pieces of other beings. The creature, however, had managed to escape, only to die in the bitter cold of the mountain snows. To cheer themselves up, Frankenstein and Hard decide to attend a carnival in town. Although they are heavily disguised, the Baron gives himself away, and they are almost arrested, but they manage to escape by dodging into the tent of "The Great Zoltan," a mystical hypnotist. deaf and dumb beggar girl who befriends them. A violent storm threatens, and the girl beckons them into the cave which is her home. In an inner recess of the cave, Frankenstein is dumbfounded to find, perfectly preserved in ice, the body of his "creature" of many years ago, and reasons that it must have fallen into the glacier when the villagers chased it into the mountains. Frankenstein and Hans manage to free the "creature," and transport it back to the Baron's castle. Using the electrical power generated by the storm, they reanimate the creature; and though it lives, its brain is dormant. Frankenstein returns to the fair to ask "The Great Zoltan" to use his hypnotic powers to restore the "creature's" brain to activity. Zoltan is able to do this, but the creature is completely under Zoltan's hypnotic spell, and Frankenstein is forced to accept Zoltan as a "partner." Without Frankenstein's knowledge, Zoltan has the creature commit robbery and murder. 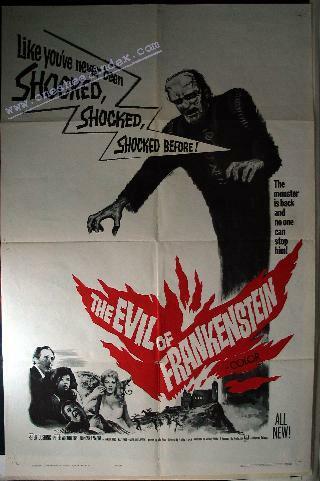 By this time, the Chief of Police is aware of Frankenstein's presence in the castle, and arrives to arrest him . . .
Special Effects ............................... Les Rowie.